Droppers are mollusk enemies that inhabit Kitchen Island in Wario Land: Super Mario Land 3. They are mostly found in Rice Beach, but they can also be found in other areas such as Sherbet Land, where they can be seen frozen in ice blocks. Droppers are named for their abilities to drop from ceilings, which they are able to cling to with their snail-like underbellies. 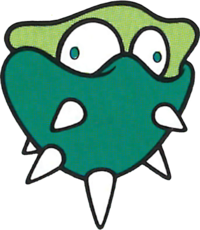 Their behavior and appearance are similar to those of the upside-down Spinies from Super Mario Bros. 3. They inch towards Wario while still on the ceiling and will come crashing down when he is within striking distance, causing damage upon contacting their spiky shells. To defeat a Dropper, Wario must wait for it to fall from the ceiling and then attack while it is defenseless. In this state, the creature can also be picked up and thrown at another enemy. Upon defeat, the monster will cough up a coin. ↑ Wario Land: Super Mario Land 3 English instruction booklet, page 18. ↑ Super Mario Land 3: Wario Land Japanese instruction booklet, page 19. This page was last edited on January 3, 2019, at 21:01.